Prospective customers who are visiting your office are not only serious about your product or service but they are also curious about your style and tastes. 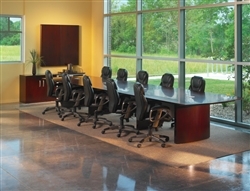 Conference room tables can portray an air of success and comfortability. Certainly you want your future customer to know that quality and appearance are integral to your business philosophy. Office Furniture Concepts offers a first rate selection of conference room tables and office chairs to adorn your boardroom. Laminate and wood veneer conference tables have a luxurious look and can be complemented with any style of office chairs. They are constructed with quality materials and come with a finish that is durable and resistant to scuffing and marring making your conference room setup gleam for many years. A wide range of colors and tones allow you to match any décor, and different sized tables can be matched to accommodate meeting rooms, reception areas and other areas of your office to ensure a constant flow throughout. Existing customers, prospective customers and in-house employees will use these tables and recognize the quality through commitment that your company portrays. Complement your conference room tables with quality made ergonomic office chairs offered by Office Furniture Concepts. Our ergonomic office furniture comes in various styles from low back chairs in the general office area, manager’s chairs for executive offices, and rich looking chairs to accent your conference room table. Leather boardroom chairs are often the first choice because of their luxurious design and comfort. Consider a traditional or classic look, available in many colors, and designed with an ergonomic, form fitting structure for people of all shapes and sizes. Sink into one of our leather chairs and you may not want to leave your desk! Shop with us online and you will find a vast array of office furniture needs including accessories. We pride ourselves in excellent customer service and we offer free planning advice from our in-house experts. Office Furniture Concepts has nearly 25 years experience helping businesses outfit their offices with style. Contact us at 888-632-8480 for a free consultation.